I have tried to do Google search to determine my problem but i am unable to resolve it. The datatable came from an .xls file. Below are the screenshot of the tables stored in my sql server. I assure you that I have been complying to Case Sensitive rules. Based on the code you have posted, you are writing an empty datatable to the database. Your "ExportToGrid" method fills dt, a DataTable declared locally, which loses scope outside of the method. Your write function is calling the static DataTable dt which is a new datatable. This removes the need for variables outside of the scope of the method. I dont see anything obvious compared to my use except for the fact that I explicitly map columns from the data table to the database table. "data source=DBSERVERNAME;initial catalog=DBNAME;persist security info=True;user id=USERNAME;password=PASSWORD;packet size=4096"
I doubt the connection string is a problem assuming youve used it elsewhere. 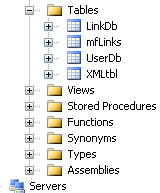 Finally have you checked the data types for the columns in the dataset datatable match the ones in the database. In my experience oledb load from excel does not always produce output you might expect, date fields and columns with mixed text and numbers being perticular problems.